To sleep soundly, you need peace of mind. You need to know that what you value most-your home and your family, are safe and secure. According to statistics, homes without alarm systems are three times as likely to be broken into than those that do. The facts are in-security systems are effective in preventing loss of life and protecting property. Like millions of others, you’ve realized that your peace of mind is what matters the most, and are considering purchasing a home security system. Smart move! Your home and your loved ones are, after all, your most precious assets, and a home security system is one of the most important investments you’ll ever make. Trouble is, the decision can be overwhelming-especially if you have a lot of basic questions! What do I need? How do these systems work? What is that central monitoring station anyway? Will my Labrador Retriever set off my alarm? Relax. we can help. Here you’ll find the answers to some of the most commonly asked questions and concerns voiced by homeowners like you. At Mci Eastern, we’re proud that thousands of families continue to place their trust in us, and we know that your family will feel at home with our products, too. After all, your security comes from knowing you’ve made the very best choice for their protection. For peace of mind, insist on Honeywell. We make it easy for you to rest easy. It’s our job. I’ve been thinking about buying a security system for a while now, but I don’t know that much about them. How do they work? A security system starts with a control panel. Usually located in a closet or a basement, the control panel contains the "brains" of the security system, and essentially operates as a central computer. 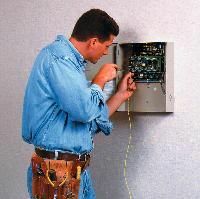 Various sensors connect to the control panel from locations throughout your home. If your security system is armed and the sensors detect a problem, they send signals to the control panel. The control panel automatically dials the central monitoring station, where the proper authorities are notified. What does the keypad do? You operate your security system by entering your security code at the keypad. Generally located at entry doors, keypads can arm and disarm with push-button ease, and literally put security at your family’s fingertips! Good features to look for include illuminated keys to provide you with greater visibility at nighttime, easy-to-read English displays that spell out your system’s status at a glance, and one-touch function keys that provide single-button operation for arming, disarming or emergencies. Most keypads even offer convenient additional user codes to give friends, neighbors or service people access to your home. Magnetic contacts are two-part devices used to safeguard windows and doors. One part of the contact is a switch installed in the window or door jam; the other contains a magnet and is placed in the window or door itself. Any noticeable shift in contact with the switch results in an alarm. 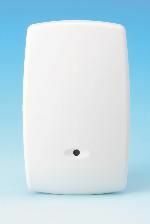 A passive infrared motion detector (PIR) is an electronic security device that detects intruders by "sensing" motion or body heat in the area being protected. Most PIRs are designed to be used when your family is away from home or when no one will be passing through the area "covered" by the PIR. I have a dog! Does that mean I can't install a PIR? Absolutely not. Recent innovations in security technology have resulted in the creation of "pet immune" motion detectors-allowing dog and cat lovers to enjoy the same level of protection they would receive with a standard PIR. These state-of-the-art sensors provide "pet immunity" for animals weighing up to 100 lbs. Pet immune PIRs allow your pet to move about freely but can still detect an intruder’s movement. Speaking of sensors, how are the "glassbreak" kind operated? "Acoustic" glassbreak sensors, usually mounted on ceilings or walls, work by "listening" for the sound of breaking glass in a window. "Shock" glassbreak detectors are mounted on the window and "feel" the shock of breaking glass. This kind of advanced wireless technology can provide shatter and shock protection for your windows, for often intruders are "sensed" and an alarm sounded while they are still outdoors. This is often enough to send a burglar running! I already have a battery-operated smoke detector, so why would I need one installed as part of my security system? What’s the difference? Since you own a smoke detector, you obviously realize what an important safety measure this device is. That’s good. Smoke detectors are highly effective in preventing loss of life and property. 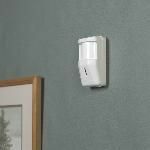 However, there are differences between the "stand alone" or battery-operated smoke detector you would buy at your local hardware store and one installed as part of your home security system. "Stand alone" detectors are not connected to other detectors or warning devices. A smoke detector connected to your security system offers more protection because it is monitored by a central station. If fire strikes, the detector sets off an alarm and sends a signal to the control panel. The control panel dials the central station, where the operator notifies the fire department. Only central station monitored smoke detectors provide automatic notification of authorities when you or your family are asleep, not at home or unable to get to the phone. I’ve been hearing so much about these "wireless" security devices. Do they really work well, and are they easy to use? Yes on both counts! Technological breakthroughs have led to the development of wireless electronic security products, and their effectiveness has been proven time and again over the years in millions of installations. Their rock-solid stability and long battery life make them a popular choice among homeowners and dealers alike. They give installers the flexibility they need to overcome obstacles like brick walls, cement floors and cathedral ceilings; and no drilling holes preserves the beauty of your home and results in cleaner, faster installations. Folks today enjoy the convenience of remote control devices, and the security industry has responded! User-friendly wireless products provide the dual benefits of superior performance and ease of operation. Wireless keypads allow you to activate and de-activate your security system with the touch of a button, and can even be programmed so that a young child can operate it with ease. Homeowners especially love wireless keys! 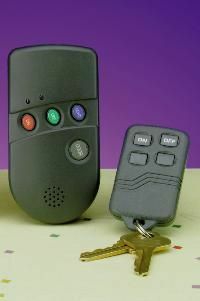 Similar in size to a remote car alarm key, they fit right on your keychain, and the press of a single button lets you control your system, lights and appliances-eliminating the need for codes. This is especially great if you and your family enjoy spending time outdoors. Relax by the pool, garden, barbecue and entertain, or play with your kids in the backyard-enjoy extra mobility without compromising your safety! Another hot item gaining popularity is the interactive phone module. By adding the phone module to your home security system, you’ll have remote control access from any touch-tone or cellular phone-from your office, on the road, or anywhere in the world! Conveniently arm, disarm or check the status of your system, turn your lights on or off-you can even control your thermostat and air conditioner!